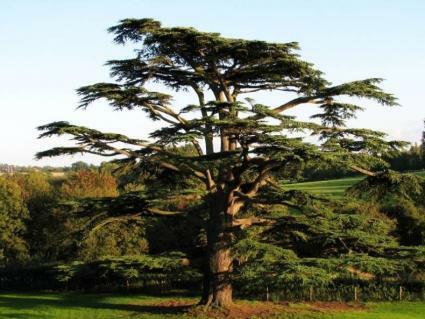 Although many trees claim the name, a true Cedar is a member of the genus Cedrus. There are four species in the genus. These conifers are native to the Himalayan Mountains and the Mediterranean regions. The generic name Cedrus is from the Greek, 'kedros'. 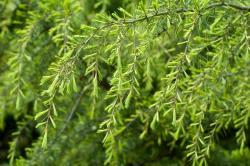 These beautiful evergreens are also valued for their resinous scented wood. Cedar needles are different from those of other conifers; they are produced in dense spiral clusters on very short shoots. Their color varies from grass-green to dark green, to a pale blue-green, depending on the thickness of the white wax layer which protects the needles. The cones are barrel-shaped and held erect. It takes about two years for their seeds to ripen completely. These trees can grow up to 100 feet tall with an equal spread, although most Cedar in cultivation are smaller.Cedrus deodora is hardy in zones 7 and 8. It has a pyramidal form with pendulous branches. This tree has a moderate growth rate and matures to a height of 40 to 70 feet with a spread of 30 to 40 feet. Cedrus libani is hardy in zones 6 to 9; the variety stenocoma is hardy in the warmer parts of zone 5. This tree has a conical shape when young, growing to a flat-topped mature tree with very wide-spreading horizontal branches. The leading shoot is sometimes slow growing, but once it gets started, growth is rapid. In cultivation, most specimens are 50 to 70 feet tall. The needles are green. Cedrus atlantica is hardy in zones 6 to 9. It has a rapid growth rate, with a mature height of 60 to 100 feet and spread of about 40 feet. The needles are green to silvery blue. Mature trees are quite drought tolerant and cast dense shade. Cedar will grow in full sun to partial shade, but really need full sun to develop to their fullest potential. They are not fussy about soil type or pH levels. They require good drainage and will not tolerate a wet or boggy location. They are drought tolerant once fully established. Cedrus atlantica may need to have its lateral branches pruned back when young, as the branches can break under their own weight. Cedrus libani has a tendency to produce multiple leaders; some of these can be pruned if desired. Propagation is best by seed. The wood of all Cedar species is oily, sweet-scented, and very durable. The scent wards off attacks from insects so that clothing, when stored in closets or chests made of this wood, is usually safe from moths. Cedars are popular ornamental trees in mild climates. They are beautiful specimen trees. Some types can be espaliered. Cedrus atlantica 'Glauca Pendula' is much smaller and slower growing. It is especially handsome in rock gardens, and the flexible branches can be trained to grow along fence tops or over arbors. Cedars are remarkably free from problems.